Home / غير مصنف / Brexit deal: What is in Theresa May's Brexit deal? What could May have agreed with EU? Brexit deal: What is in Theresa May's Brexit deal? What could May have agreed with EU? Downing Street confirmed this afternoon that a tomorrow a meeting would take place to consider a draft agreement on exiting the European Union. In a statement, they confirmed the time of the meeting saying: “Cabinet will meet at 2pm tomorrow to consider the draft agreement the negotiating teams have reached in Brussels, and to decide on next steps. Cabinet ministers have been invited to read documentation ahead of that meeting." This comes after last-minute ditch talks between the UK and the EU took place in Brussels this week. Theresa May will now have to face the daunting task of putting her deal before the Cabinet, hoping for agreement. 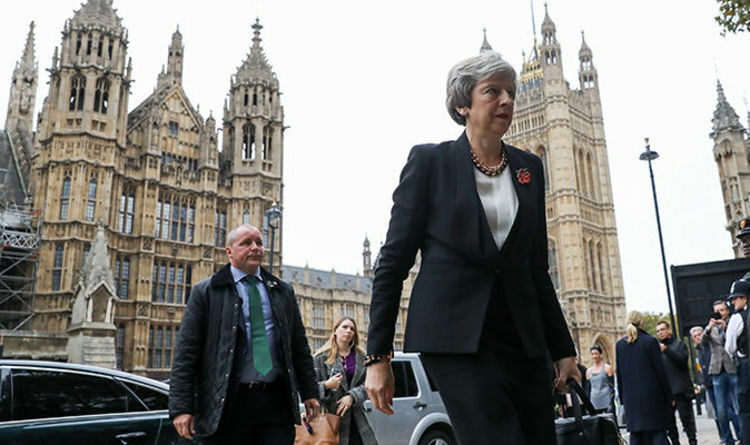 However, several prominent MPs have disagreed with the Prime Minister’s deal already, with one calling it “deeply unsatisfactory”. What is in Theresa May's Brexit deal? The crux of the draft agreement to leave the EU hinged largely on the contested Irish backstop. The Irish backstop has been the centre of much disagreement, but Irish news site RTE reports a deal has been agreed. According to RTE, two well-placed sources confirmed the draft document was "as stable as it can be", however, that it would not be correct to say that negotiations have "concluded". Both sources reportedly told RTE there will be one backstop in order to avoid a hard border on the island of Ireland. This backstop will be in the shape of a temporary UK-wide customs arrangement, which will have specific provisions for Northern Ireland. These provisions will go deeper on the issues of customs and alignment on the rules of the single market than for the rest of the UK. They also report that the document has an agreed review feature. While the text is regarded as "stable", it is understood there is further shuttling between London and Brussels. Conservative Brexiteer Jacob Rees-Mogg told the BBC if details of the text reported by Irish broadcaster RTE were true, the UK would become a "vassal state" with Northern Ireland "being ruled from Dublin". Mr Rees-Mogg added an agreement "failed to deliver on Brexit" and the cabinet should reject it. "I think what we know of this deal is deeply unsatisfactory," he said. "There seems to be growing opposition to these very poor proposals." These developments came after the prime minister told her ministers this morning (Tuesday) that only a “small number” of issues remained to be resolved and her deputy David Lidington described a Brexit deal as “almost within touching distance”. A draft of the UK’s withdrawal agreement published in March was said to finalise the issue of the rights of EU citizens living in the UK and UK citizens living in the EU. The Prime Minister has guaranteed the rights of EU citizens in the UK even in the event of a "no-deal" Brexit. The UK and Spain have "developed a protocol and a set of underlying memoranda relating to Gibraltar, heralding a new era in our relations", according to Mrs May. A protocol relating to two British military bases in Cyprus has been agreed by both the UK and EU. Also agreed in March was the implementation period which agreed the UK will maintain the status quo of EU membership between the date of Brexit on 29 March next year, and 31 December 2020. The UK’s divorce bill was marked as settled in March, with the Treasury estimating the cost to be between £35bn and £39bn.